Well....school holidays are here, and of course Christmas is less than 2 weeks away, so unfortunately I haven't been able to paint as much as I'd like...so I thought I'd 'post' a 'work in progress'. This is a large artwork, oil on stretched canvas - 91 x 122cm. Back in September I spent a week at Kings Beach on the Sunshine Coast. I took my sketch pad and did a bit of drawing while my kids were 'yahooing' on the beach. It was interesting observing all the different ages and groups of people all socialising 'at the beach'. 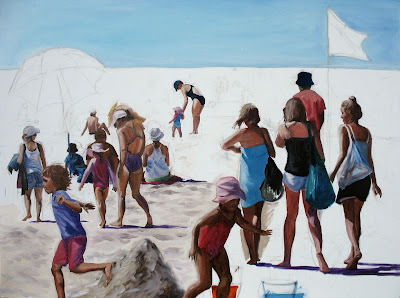 I'm trying to convey that in my painting....'Beach Life'. I've still got alot of work ahead of me. I'm still not sure about some of the sizing of the figures in the distance and I'm also not really sure if it's all going to come together and work... but I will be able judge better when I complete more of the background, water and figures. Hi, Amanda. I am always impressed by your productivity, both the quantity of paintings you do and their quality. One aspect of your images that always strikes me is how you averted the faces of your subjects, placing a buffer between them and the viewer. Gives me the impression of a memory or a dream. Very nice. Best regards. This is once again a brilliant piece in the making. You capture people so well their gstures and postures are so real. I fell like I am on a crowded beach in the hot summer sun. Hi Candace....its hard work trying to fit in time to paint, spend time with the kids and look after the home too....but the housework can wait...heh heh! Yes...I think not showing the faces adds a bit of mystery plus I think purchasers prefer not to to see the faces...they can relate more and pretend that it's their own children. Thanks again Kay....I'm so happy that you 'see' what I see...I was worried that it might look too 'busy'. Like I said...I'm still a bit worried about the sizing of some of the figures, but I still want to add a few more in the distance and in the water...hopefully it will all work out.